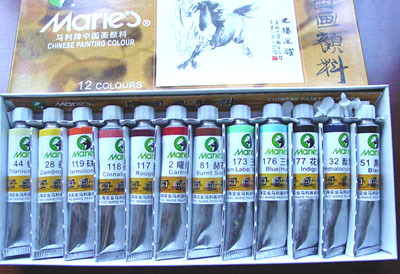 Home > Asian/Oriental/SumiSupply > Colors > ACS-90C12 Marie Sumi Watercolors-12 Color Set- 12 ml. Good news for professional and student artists who like to use large amount of color. Marie color is especially designed for Sumi paintings. Colors are more receptive on rice papers. Won't bleed while mounting. Vibrant colors. Set of 12. Excellent product and exactly as advertised and presented. The colors are bright and easily mixed allowing wonderful variations in tonality and depth of color. Good watercolor paints for gong bi. The colors are strong and can be mixed easily to obtain different gradations. They last a long time and the price is just right. Very nice strong color, mixes easily into water for a creamy flowing paint.